After nearly five years of anticipation, Fallout 4 was released for Playstation 4, Xbox One and PC’s on November 10th. The game will be a sequel to Fallout: New Vegas, which came out in October of 2010, only about a month more than five years apart from the newest game. Mountains of hype had been built up over the post-apocalyptic game, as Fallout 3 and New Vegas gained a devoted fan following in the years of their release. Every year, as video game expositions came and passed, fans would pray for Fallout 4’s surprise unveiling, but there wasn’t a lot of luck up until E3 this past June. Bethesda, the company that developed Fallout 3, had their first ever presentation at this year’s E3, a video game exposition centered around advertising big upcoming games. About a week before the actual presentation at E3, Bethesda put a countdown on their website with the signature “Please Stand By” loading screen from the previous installments in the Fallout series. When the timer reached zero, a trailer for the game was put on the Bethesda website, and it was alluded to that the headliner for Bethesda’s E3 presentation would be Fallout 4. After the conference at E3, it was announced that the game would be released on November 10th of 2015, a surprise to many fans as they did not expect it to come out this year after such a long wait. But, after 5 months, in which several other promotional videos and special packages were released, the game finally came out. 12 million copies were sold on release day, generating 750 million dollars in the first 24 hours after its release. It left Call of Duty: Black Ops 3, which earned 550 million in its first 72 hours of release, in the dust. It is expected to be the most profitable game release of all of 2015. The game itself is absolutely amazing, in my opinion. It’s lived up to nearly every expectation and then some. The game mechanics have been heavily improved upon, even though many were worried that some game aspects they loved from the third game and New Vegas would be ruined in 4. Most of these things, like lockpicking and hacking mini games, have stayed the same. Some changes were made to character customization, which has been replaced with a much more diverse and seamless slider system, and to the leveling system, which has made leveling up more perk based and less confusing, taking out the immeasurable 1 to 100 system of Fallout 3. Graphics wise, the game is beautiful. Bright blues and yellows compliment the post apocalyptic city of Boston, where the game takes place. The vast landscapes of the wasteland setting are eerie but exciting, making the player desire even more so to explore them. 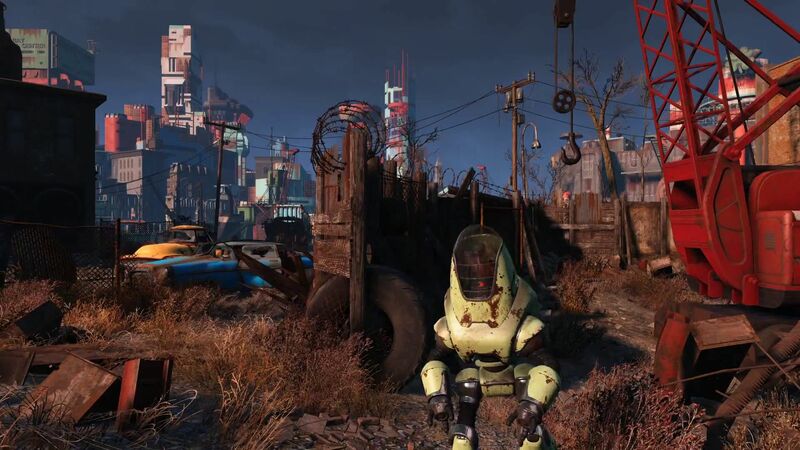 Bethesda has always been praised for their landscape and setting graphics, but Fallout 4 is the best so far. The game stuck to its roots and utilized a 1940’s and 50’s theme, playing Nat King Cole and Ella Fitzgerald tunes over the radio and letting the character wear poodle skirts and sweater vests with slacks. On top of this, though, they added a colonial theme, due to the Boston setting, letting the player join a group called the minutemen, and adding time period themed guns (like a musket that can shoot lasers). Though the story is a little rough around the edges, I feel the gameplay and side missions make up for this. The story stuck to a very strict blueprint in Fallout 4, where every character seems to come from the same roots; a couple with a newborn child. This backstory makes it much harder to create diverse characters, as it feels uncomfortable to have a mass murdering mother or a mercenary dad. The main character’s affection for their son is hard to sympathize with as well, as there was little relationship development between them. Despite this, the character and worldbuilding is done very well. All of the companions you can gain the aid of are fleshed out and interesting, and the settlements you can find are vast and full of quests. All in all, Fallout 4 has lived up to nearly every expectation given to it, and has impressed fans all over. The game is expected to attain extremely high praise and win several Game of the Year awards. Bethesda continues to gain profits from the game, especially due to Christmas approaching and downloadable content that will soon be released. The game is everything we could have expected, and might have even been worth the five year wait. Content and multimedia content © 2019 Norse Code. All rights reserved.